A voter wears a sticker after visiting a polling place in Washington on April 3, 2012. WNYC’s “On The Media” has a great series called the “Breaking News Consumer’s Handbook,” and as part of our ongoing partnership with them, we put together a handy list of rules for interpreting election polls. Wait. Shrug off polls until just before primaries, or until after the conventions for the general election. Even within a week of a primary election, the polls are often inaccurate. The polls more than a month out are, at best, a guesstimate. General election polls are far more accurate on the eve of an election, and the candidate who leads after the major party conventions is likely to win. Ignore national primary polls – they measure nothing. (But state polls matter.) Unlike in general elections, when all states vote on the same day, the primary calendar is sequential; each state’s results often affect the next state’s. The national polls don’t add to your understanding of the race — just look at surveys of the upcoming states. Ignore hypothetical matchups in primary season – they also measure nothing. 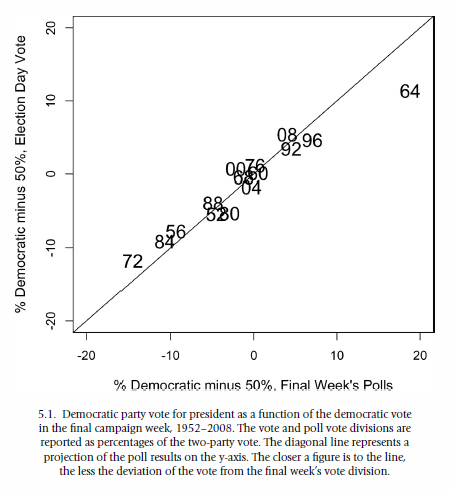 General election polls before and during the primary season have a very wide margin of error. That’s especially the case for candidates who aren’t even in the race and therefore haven’t been treated to the onslaught of skeptical media coverage usually associated with being the candidate. Look for polls of likely voters, not just registered voters. Voter turnout in primaries and non-presidential year general elections is often low. If you want to know who is going to win, you need to poll the people who are more likely to vote. Look for polls using live interviewers; they’re often more accurate. Although there are solid pollsters who don’t use live interviewers, studies show that pollsters who do tend to be more accurate in primary and general elections. Live-interview pollsters can reach landline and cellphone users, while robo-polls and Internet pollsters often miss big slices of the population. Be wary of Internet polls; they’re less tested. There are a number of good Internet pollsters, such as SurveyMonkey and YouGov, but these pollsters don’t have a long track record in primaries. In general elections, they tend to be at least as accurate as other types of pollsters. Know the polling firm – some are waaay better than others. Polls sponsored by major news organizations (ABC News, NBC News, The New York Times, etc.) are often the most accurate because more money is spent on them. If you haven’t heard of a pollster before, there’s probably a good reason for it. If you’re in doubt, check the FiveThirtyEight Pollster Ratings. Margin of error and sample size matter less than who’s in the sample. Good polling costs a lot of money, so many times the best polls have a smaller sample size (the more people you call, the costlier the survey). That raises the statistical margin of error, but the margin of error for a sample of 400 is less than double that for a sample size of 1,000. What you don’t want is coverage error, in which you’re polling people who won’t even vote or ignoring people who will. Beware polls tagged “bombshells” or “stunners.” Outliers are usually wrong. “Surprising” polls are usually outliers. Anyone remember when Gallup called for a Mitt Romney victory in 2012? That was wrong. Instead, look at averages or trends in polling. There’s a reason we aggregate polls at FiveThirtyEight: The aggregate is usually better than any individual pollster. That’s especially the case in general elections. In primaries, the trend line can be more important, as a candidate with momentum heading into a contest often outperforms his or her average. Asking people about their votes “if the election were tomorrow” is designed to heighten drama by reducing “undecided” responses. The average primary poll finds that only about 10 percent of voters are undecided, even months from the election. Yet, the vast majority of primary voters don’t make up their minds until the final month before voting. The true number of undecideds are far higher than polls indicate far out from an election. Consider the motives of the media reporting on polls. They want headlines. This one is self-explanatory. The media are interested in your readership. Moreover, partisan news outlets are more likely to give press to those polls that favor their preferred candidate. We’re collaborating with “On The Media” throughout the 2016 election to track how polling and media narratives intersect. Read more about our efforts here, and find the full archive of segments here.